On the odd occasion where I will rise from my bed in the morning, granola is my morning saviour. It does this magical thing. It stops me (and hopefully the general public) from letting off countless and embarrassingly LOUD rumbles from my stomach – at least until lunchtime. The other great thing about my breakfast granola? It lasts for 1 month. That’s 1 month without a rumbling tummy for those early risers. In a large bowl combine the oats, sesame & pumpkin seeds, almonds, salt and coconut. Set aside. In a small saucepan on medium heat, add the maple syrup, honey and oil. Stir until warm. Pour the warmed syrup directly onto the oats and stir with a spoon until everything is coated. Next, divide the mixture into two and pour into the large round tins. Spread the granola out evenly for an even bake. Bake for 45 minutes, making sure to stir the granola every 10/15 minutes whilst in the oven to help form 'clumps', if the granola appears a little dry now is the time to add a little extra oil to the mix. Set aside to cool. Transfer back into a huge bowl much like this one and enjoy for 1 month. 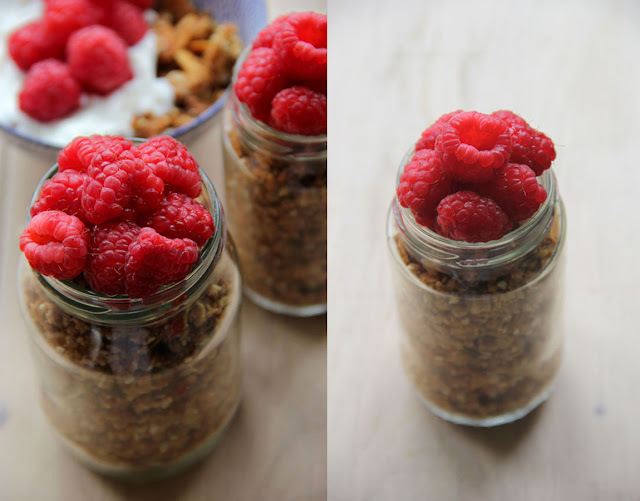 PS, I promise this is a granola post and not a raspberry one! I know what you mean about substandard granola, yet somehow I've never tried making my own. This really does look like the perfect breakfast. thanks jo, it is the perfect breakfast - perfectly unhealthily good! I really should have put the emphasis on the granola and not the granola! i hope you have cured your craving ! 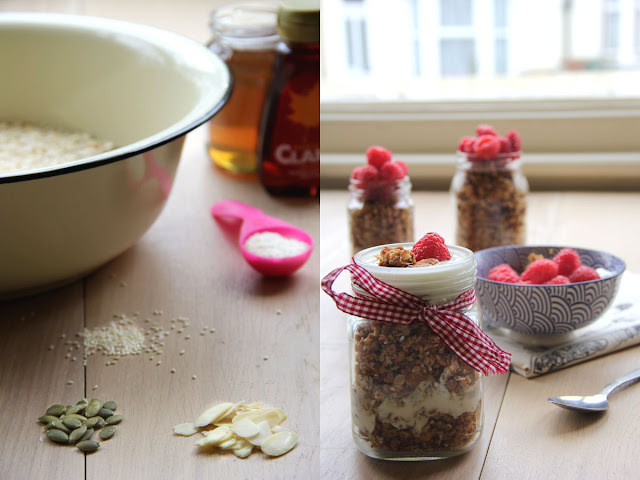 this granola has persuaded me to be a morning breakfast person! Wonderful! Nothing can beat homemade granola. Look delicious I love this and love raspberries! !